One of my first cousins on my dad’s side was adopted. Our families visited each other every few weeks; my aunt and uncle lived in a different city, but either they or we would make the drive on a Saturday or Sunday. We didn’t go anywhere when we visited – not out to dinner or to a store to shop or to a museum – we just went to visit. The parents would perk coffee and sit around the table and talk about all the important stuff and I would hang out with my cousin and her dogs and my sibs. Well, the dogs really belonged to my uncle; a mother and daughter French poodle duo. They yapped and jumped on you and were wonderful. Sometimes my dad and uncle and another uncle, would watch football on Sunday afternoons together, while the aunts and my mom would talk in the kitchen with the coffee pot on the table. While my uncles were yelling at the teams on the television set, we kids would play with the two French poodles and hang out together. My beautiful cousin had the most fabulous pair of white, lace-up, boot roller skates with quiet wheels – you know, the kind you wear at rinks. I had a great pair of skates, don’t get me wrong. They were the kind you attached to your shoes and tightened with a key. I won them in a radio contest for writing a good letter to Santa Claus. I didn’t even know there was a contest, but some official person must have liked my letter and I won! When my parents drove home with the prize, my brother and I took turns roller skating on the kitchen floor. What a thrill. My family had a bunch of skates in the basement and they all worked, but these were shiny and new without a speck of rust. I used them all the time, but my cousin’s skates were special. You wore them at a rink. I didn’t even know where there was a rink – certainly not in my town. Who went to a rink, anyway? Well, rich kids must have gone to a rink, rich kids and adopted kids. Anyway, these skates were really something, and my cousin and I wore the same shoe size so I could put them on and try them out in her house. And it wasn’t just the skates. This same cousin went to this summer camp once that was like heaven. You didn’t sleep in some musty-smelling, hot and gunky canvas tent. Oh, no, you slept in one of the wonderful cabins with walls and nice bunk beds and you could pick the top bunk and climb up it and touch the ceiling. This camp had a trampoline. Who had a trampoline? Not the Girl Scout camp I went to once. Well, there was this one hotdog stand in town that had a trampoline and go-carts to drive, and you had to pay to use them. But that was it. Nuns ran this camp; my dad used to do some plumbing for them once in a while and I learned not too long ago that this one rocking chair I love and actually have in my home today was a gift to him by the nuns for helping them out. It wasn’t a new chair, but they just said to Dad that he could have it if he wanted. These nuns were nice and smiling and happy to see the kids and they let them jump on the trampoline. Now my first cousin on my mom’s side was also adopted. Like my other cousin, he had his own room. And he had a dog, too. Being a boy, he probably didn’t want a pair of white boot roller skates, but he did own a full set of Dr. Seuss books. Can you imagine having your own set of Dr. Seuss books? I remember bringing home The Cat in the Hat from the library and my mom loved it and laughed when I read it. I never asked her to get me my own set of Dr. Seuss books; it never occurred to me. But when you’re an adopted, only child, things like that happen. The mailman did bring Highlights and Humpty Dumpty magazines when we were kids and that was great. I loved that we read the same magazines the dentist displayed on the table in his waiting room. And one time when I was in Kindergarten my mom bought me this book of holiday stories with fabulous illustrations, and I loved it. I found the exact same book when my kids were little and I bought it for them, too. Now don’t get me wrong. I loved my sibs. My sister and I made doll clothes, and my younger brother and I played army in the back yard. My older brother and his friends would come over and sit around the kitchen table and once they helped me with my science experiment to make a volcano, but I couldn’t remember what I was supposed to add to the vinegar to create the “molten lava” erupt. We tried sugar and flour and all kinds of stuff, and then finally we realized it was baking soda. My cousins from town would pop in all the time with my aunt, and we would play records and make music and sing and talk about good stuff, and one cousin always styled and “teased” my hair. Never, ever once did my older brother and sister and cousins shoo me and my younger brother away because we were the younger kids. Never. So in my daily search for my Adoption Papers (I KNEW there must be something called “Adoption Papers”), I have to say that I never once wanted to negate my own sister and brothers. Frankly, that just never occurred to me. Why would I want to do that? My thought process was simple; if I were adopted, I, too could have cool things like fancy roller skates and Dr. Seuss books and go to a camp with a trampoline and always wear really new clothes. So nearly every day I would enter my parents’ room and go in their closet, heading for the left side where there was the most marvelous and deep cubby space cut into the wall. It was a perfect storage area for luggage. Scattered among the luggage was this one old red small suitcase, the kind with a little mirror inside and women can pack their toiletries in it. Come to think of it, I don’t remember anyone ever using this case, but I knew it was important. I was convinced my Adoption Papers were in there. In actuality, there was nothing in there but the mirror and a smooth, silky-fabric lining with a gathered pocket, and space. I always checked in there, though, and in the other suitcases in the cubby hole because I knew that this would be the perfect place for Important Papers. My mom also had stashed a few little keepsakes like my big brother’s projects from Boy Scouts in the cubby, and I loved looking at those. I never found my Adoption Papers, but I always enjoyed the hunt. I t never occurred to me to look in other places, like under the bed or in the desk drawer, or even ask my mother where the papers were located. I had to find them for myself. One day my mom found me in her closet, searching the cubby and the red little suitcase, and asked me what I was doing. “I’m looking for my Adoption Papers,” I told her. She went into my brothers’ room and gathered my younger brother and in one movement, set me and my brother next to each other in front of the full-sized mirror on the back of the door. “Don’t you see the resemblance? You LOOK LIKE YOUR BROTHER!” Then she left. I wasn’t adopted? Was this true? My brother and I walked out of our parents’ room, not even stopping to tip up all the handles on their dressers so that they would make a great clicky sound when my parents touched them and flipped them back down again. What a disappointment. After that day, I didn’t search so furiously anymore for my Adoption Papers. I didn’t tell anyone how sad I was, but I sure felt bad. But wait a minute! I had heard the grownups say that lots of times parents don’t want to tell their kids they are adopted. The grownups said this makes the kid feel bad. I never knew why kids would feel bad when they found out they were adopted; that seemed silly to me. There was an orphanage in Hartford that we used to drive by on our way into the city for a special day out, and the orphanage looked nice. Those kids would know they were adopted; how could they not? One minute they would be living in a pretty orphanage in Hartford, and the next thing they would be adopted and living in a home somewhere with a family. The grown-ups couldn’t hide the adoption from these kids. And my two cousins knew they were adopted and they didn’t feel bad. But perhaps my mom just worried that the truth would make me feel bad, just like they always said. It didn’t matter that I looked like my brother; she was just trying to make me feel good about my situation. That was it! So when I did search for my Adoption Papers, I made sure my mom was really busy downstairs, like when she made dinner, and my dad was at work. I planned it so when I found my papers, my parents wouldn’t know, and then the grown-ups wouldn’t have to talk about it when they drank coffee at our house or my uncle’s house on the weekends. When I found my Adoption Papers in the pretty little red suitcase in the cubby in my parents’ closet, then I would get my very own set of Dr. Seuss books, and I could go roller skating at the rink with brand new white boot skates, and my sister and brothers and cousins could all skate, too. That would be a blast. Dinner guests used to smirk when I pulled out my electric percolator. I had finally upgraded from my old beat-up stove-top metal variety that my parents used when we were kids. But finally, when my own kids were small, my mother insisted I get with the times. In fact, she even purchased the electric percolator for me. I felt a little guilty, like I was giving up on an old friend, and I had never understand why she no longer cared to use that dented ancient stove-top classic. It made a great cup of brew. The only thing was that there was a little trick to it; you had to keep an eye on it. For those with no idea of what I’m talking about, let me explain. A percolator is brilliant in its low-techness. After adding water, you put this metal straw-like tube thing which is attached to a base, at the bottom of the pot. The coffee grounds go in a metal perforated “basket” which is inserted on the straw-like tubey-thing. The basket’s covered by a little perforated lid. Then, the cover of the pot with a clear glass bulb goes on top. That’s it. Put the pot on the stove or campfire and grab it with a potholder when it’s ready. In Westerns, cowboys always brewed their coffee this way. The principle behind making coffee is simple enough. When the water boils, droplets are forced up the straw-like tubey-thing and fall on the little perforated basket cover. From there, the drops spread out and drip into the basket, then through the grounds, and back into the pot. Watch the clear glass bulb on top of the lid and you can tell when the coffee is done. The water turns coffee-rich. When I consented to retire my wonderfully “well-seasoned” Stone Age pot for this pretty and shiny new-fangled thing, I figured I was done with the jabs. Wrong. The good-natured ribbings continued, though I don’t remember anyone complaining about my coffee. Why wasn’t I using a drip machine? Like I had room on my counter for a Mr. Coffee! I just tossed my silvery percolator in the cupboard. And no cowboys ever sat by the campfire looking for an outlet to plug-in their Mr. Coffee. Of course, the closest thing to me and cowboys was that we both like coffee, although I do enjoy my half-and-half and sweetener. But I had my pride, and I didn’t have to buy filters, either. People are always surprised when they walk into the kitchen; they expect it have a “high-tech chic modern” look because I like to cook. I prefer the tried and true gadgets, and particularly ones I don’t have to program. I must say, however, I do draw the line at rust. I had to chuck my nice hand-cranked pasta maker because it rusted. I have an electric one but am afraid to use it. There’s a video tape to watch; I wonder if the VCR is working? When my food processor from the 80s died, I was not sure how to proceed. Buy a new one and have it fall apart in a year or two? A friend came to the rescue and gave me hers. It’s the same brand and make and I don’t have to program a thing on it. The microwave is 26 years old and still going strong. One friend threatens to buy us a new one every Christmas, but I try to explain to her that just because mine takes several minutes longer than hers doesn’t mean there’s anything wrong with it. But laugh they do! And that’s before they see my radio. I love my radio; it’s one of my most valued and treasured possessions. It belonged to my Great Aunt Effie, and she gave it to my mother when she bought a new one. When I moved out of the house, my mother thought she was mailing me my radio; it was about ten years newer than my Great Aunt’s radio. But she grabbed my Great Aunt’s instead, and so there you have it. 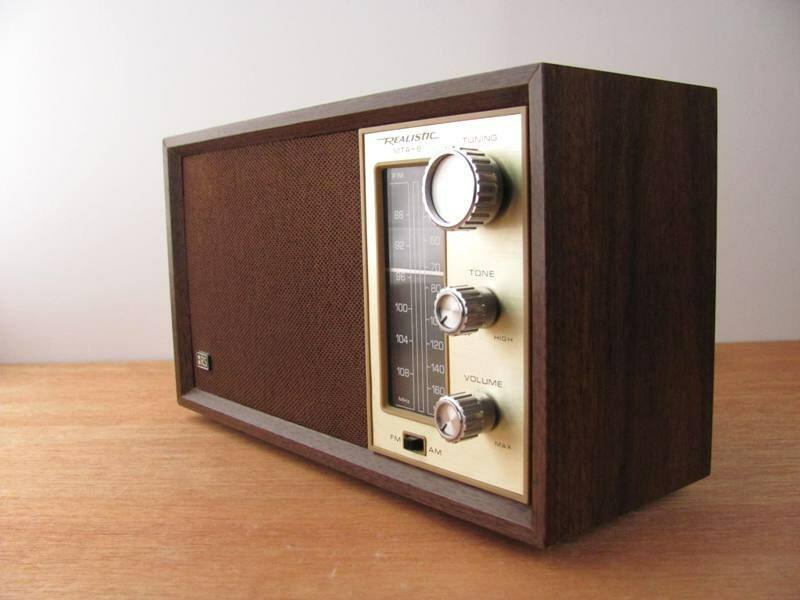 This is your basic AM/FM countertop model featuring a faux wood finish with fabric covering the speaker. It’s called a “Realistic MTA 8, and here’s what it looks like. It’s not an antique; it’s just old and worn. It has three knobs on it and they all work fine. Over the years I’ve splattered cake batter, spaghetti sauce and coffee on it. No matter — the thing just wipes off. Like the old battle-scarred coffee pot, it’s seasoned. The value is beyond sentimental, however. The radio just works. Think “Energizer Bunny.” I bought myself a nice HD radio not too long ago, and that lasted for a year before it quit. Not this baby. I’m a radio junkie and this thing is always playing. It produces a nice sound. Sometimes I have to wind the cord around a cabinet door to make an aerial antenna to get better reception, but that’s okay. I listen to baseball and hockey games on it, and news and music, and Car Talk on the weekends, and sometimes I carry it around the house with me, like when I’m painting a room. Usually, though, it just stays in its spot on the counter, and I just turn up the volume so I can hear it all over the house. No, I’m not deaf; I just don’t want to miss anything. There are times when I talk to it, well, not to the radio so much as to the person I’m listening to at that moment. I might be chuckling at a funny bit, or cheering, responding to the play-by-play announcer at a game, or presenting my humble views to the players and coaching staff in a calm but firm way after a particularly harrowing play, or perhaps quietly and oh-so-gently I’m offering my considered opinion to the politician being interviewed. Or I might be yelling and screaming, but I try not to let the dog hear me swear too much. I’m thinking about buying one for every room, and so I checked on ebay and there they were, for fifteen bucks apiece! I think my Great Aunt would approve. Heck, it’s probably what she paid. Perhaps I should pick them up for the kids as Christmas presents, too, if there are enough to go around, because then they can boast that they have a Great Great Aunt Effie radio. That’s just cool. With that problem solved, I’ll just have to find out who wants a dented coffee pot.